This formative phase decides the professional life of a student. There are thousands of questions in the mind of students. Science, Arts or Commerce, MBA, MBBS or B. Tech, IT or Designing. There is so much choice. The facilitators are well geared in their planning and management to help students strike a perfect cord between academics and co-curricular activities. This is the phase when the call of the hour is to understand the importance of 'Time-management' and 'Man- management'. Therefore the Academic programme is customised in a way to facilitate not just textbook learning but also to enable students to get familiar with the world outside. A detailed time line and guideline is put into effect for completion of work, preparation of classroom assignments and assessment. Counselling sessions are held to help students identify their field of interest on the basis of their ability and aptitude. 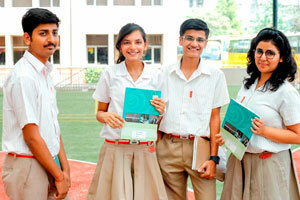 Students are provided with information on varied opportunities and avenues available. For this we often invite guest faculties from various professional fields to share their experiences with students and to guide them. Students are also encouraged to gain information about various educational and professional opportunities so that they are able to make an informed and wise choice for themselves.